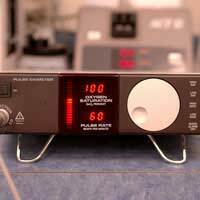 Home > Non Invasive Tests > What is a Pulse Oximeter? A pulse oximeter is a piece of medical equipment that has been specially designed to monitor the oxygen levels within the blood. It can also register the patient's heart rate and is a very useful and frequently used device utilised in all parts of the health service. It is a non-invasive piece of equipment, using a probe that can be attached to a finger, toe or ear lobe. It is not painful or uncomfortable and the probes are designed to fit the area it is applied to snugly. Using wavelengths and infrared technology, the probe recognises the differences between oxygenated blood and deoxygenated blood and calculates the ratio between the two. From this a percentage rate is produced and displayed on a screen as a saturation and is given as a percentage. A healthy person will normally have a reading of at least 95% saturation, though many will manage to live quite happily on a reduced amount such as 90%. Why do I Need my Oxygen Levels Monitored? Almost all people who feel unwell enough to require hospitalisation will have their oxygen levels checked via pulse oximetry, as often this can show the first signs of any underlying problems.Any conditions of the lungs, heart or blood flow and blood volume will be represented by the reading given by the machine. If at any time, the saturation level drops below the level that is normal for that person, or below 90%, investigations and corrective treatments will be needed to determine the cause and treat as necessary. Pulse oximetry is used throughout surgical procedures, especially those that involve the use of general anaesthetics and help the doctors to assess the overall health of their patient. It will also be monitored post-operatively and becomes a routine part of the observations such as blood pressure and heart rate that will be frequently monitored by the nurses in the immediate recovery period following surgery. Pulse oximetry is becoming a very widely used tool in the initial stages of diagnosing congenital heart disease in the newborn, especially those who show no other symptoms of the illness. A reading can indicate that further tests are necessary to help achieve a speedy diagnosis and a formation of an appropriate treatment plan. Although pulse oximetry is a very widely used tool for monitoring blood oxygenation levels, it cannot offer a profile of blood gas analysis and cannot act as a substitute for taking a blood sample and examining it’s content. It can act purely as an indicator that something somewhere is interfering with the oxygenation of blood levels and is simply an indicator that further investigation is required. A full medical history should be taken as certain conditions can cause false readings to occur, as can faulty equipment or excessive patient movement whilst the readings are being taken. The use of pulse oximetry is a very useful tool used by almost all health professionals and patients at some point. Without it, complications of many illnesses would go undetected for much longer causing prolonged strain and for the patient along with the possibility of the condition worsening. The thing I found it hard to get my head around at first was how an oximeter detects the oxygen saturation in the blood. It can detect the colour of oxy haemoglobin, nice bright red and it also looks at deoxyhaemoglobin, more of a purplish-blueish hue and then decides how much of each is present in the blood, while ignoring other tissues. clever stuff.